Home / Halo Diamond Rings / “Laverna” antique design halo cluster ring. 18 ct Antique halo cluster design ring, the central round brilliant cut diamond of 0.80 ct held in double corner claws, surrounded by round brilliant cut smaller diamonds, also set into the ring shoulder, with mille grain edging to complete the antique look. This was a custom made client order by Ellissi, with very fine and precise detailing. The 8 sided octagon shape top giving the ring an art deco look. 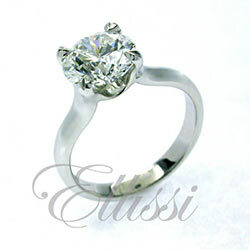 This design is suitable for many diamond sizes and can also be made with a number of differing central diamond shapes. The cost will vary depending on the diamond selection in size and grade.